Schematic view of a sulphide vein. 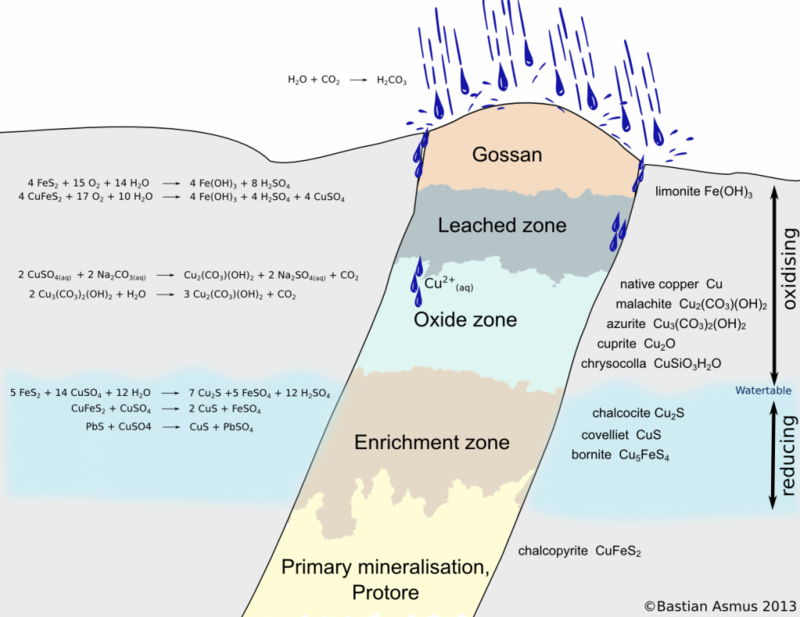 You can see the oxidation zone, consisting of the gossan, the leached zone and the oxidised zone. The reducing zone consists of the enrichment zone and the area of ​​primary mineralization. Significantly modified after Evans (1992) and Ottaway (1994). The resulting solutions may dissolve further minerals (Evans 1992). In sulphide ore bodies for example pyrite (Fe2S) breaks down to sulphuric acid and limonite (Fe(OH)3). Limonite is insoluble in water and remains in the upper zones of the oxidised ore body. Since the formation of limonite is accompanied by an increase in volume, the gossan forms in a particular way, was easily recognized by prospectors and indicated the presence of an ore body to them. The copper ions of the dissolved copper sulphate CuSO4 react with carbonates which are also easily dissolved in carbonated water. Malachite Cu2(CO3)(OH)2 or azurite Cu3(CO3)2(OH)2 are thereby precipitated. In contact with water azurite reacts to malachite. However, other ores we cuprite, chrysocolla, or even native copper can occur in this zone. The oxidation zone of a vein mineralisation is also of crucial importance for the emergence of metallurgy, because there you may find native copper and oxidic ores such as malachite side by side. There is evidence as early as 9500 years BC for the intentional collection of copper minerals. In Hallan Cemi and Çayönü Tepesi in Anatolia, we have proof for the first malachite fragments in a settlement context. Only a few hundred years later at 8200 BCE the first objects (mostly beads) made from malachite and copper, appear in Çayönü Tepesi (Yalçin 2000). This was native copper from the oxidation zone of a vein mineralisation that hammered into shape. Archaeological settlements with very early metalworking evidence prior to 5000 BC. 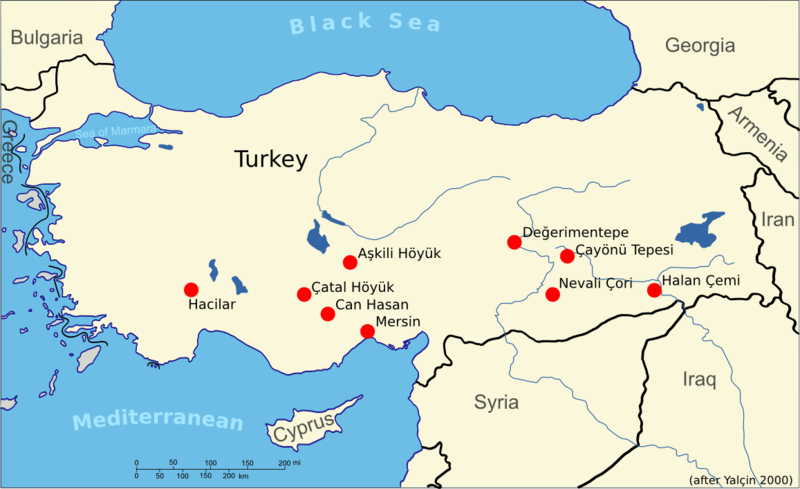 Data from Yalçin (2000). Evans, A.M., 1992. Erzlagerstättenkunde. Übers. von Udo Neumann und Gerburg Larsen. Enke, Stuttgart. Ottaway, B.S., 1994. Prähistorische Archäometallurgie. Verlag Marie L. Leidorf, Espelkamp. Menschel,G. und Usdowski, E. 1975. Experimentelle Untersuchungen über die Stabilität von Cu-Karbonat zur Klärung der Genese von Azurit im Cornberger Sandstein. Contributions to Mineralogy and Petrology 49, 141–147. Yalçin, Ü., 2000. Anfänge der Metallverwendung in Anatolien, in: Anatolian Metal, Veröffentlichungen aus dem Deutschen Bergbau-Museum Bochum. Bochum. This entry was posted on Monday, November 4th, 2013 at 15:57and is filed under . You can follow any responses to this entry through the RSS 2.0 feed. You can leave a response, or trackback from your own site.